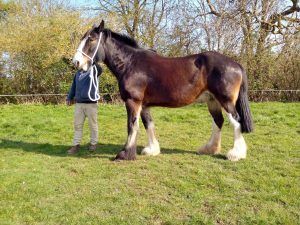 Details: Knutsford Gold Gift is a fully registered shire mare with an excellent pedigree including her dam who was a Shire Horse of the Year Show qualifier. She is huge and very chunky at 18hh with a sweet and characterful temperament. She is backed to ride and was professionally lightly schooled but turned away to have her lovely foal – just weaned. She has overwintered well outside even with a foal as she is a good doer on grass and she will fill out tremendously this spring. She is handled every day and is easy and polite. She is good with other horses and dogs etc. We decided to keep her foal so we are regretfully selling her because of space restrictions. If you are interested email me or ring. she can be seen by arrangement.